The nor'easter is expected to dump up to 20 inches of snow in Portland and about 2 feet Down East before it winds down this afternoon. 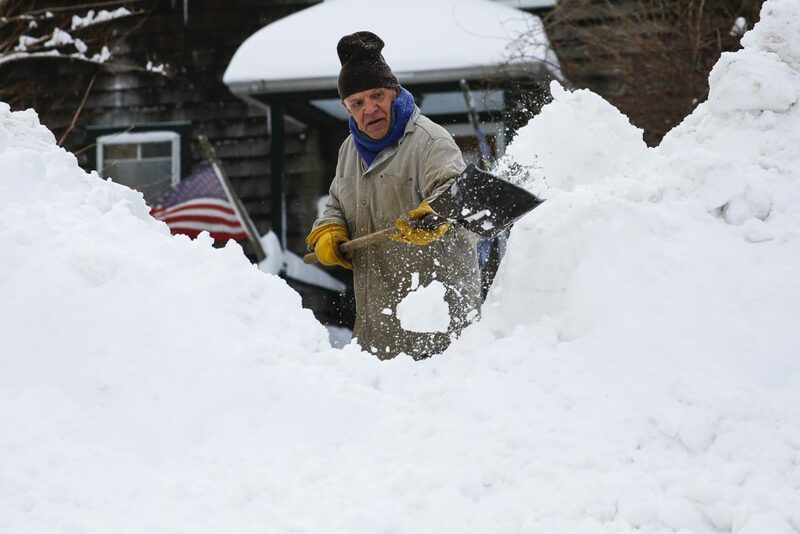 The most powerful snowstorm of the winter plowed into southern Maine on Sunday and intensified Sunday night. The National Weather Service predicted the Portland area would receive 16 to 20 inches by the time the storm winds down Monday afternoon. 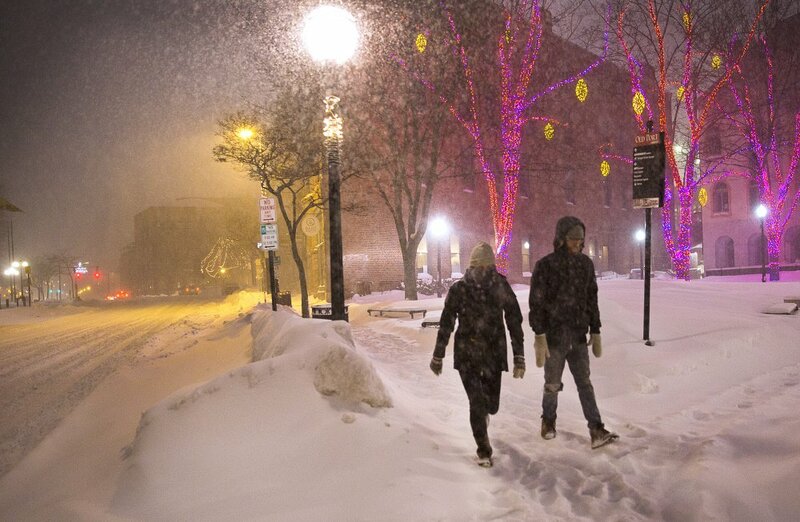 Cara Benge, left, and Nate Mosseau walk during the early hours of the blizzard Sunday evening in an almost deserted downtown Portland. They were going to meet friends after seeing Oscar film shorts. 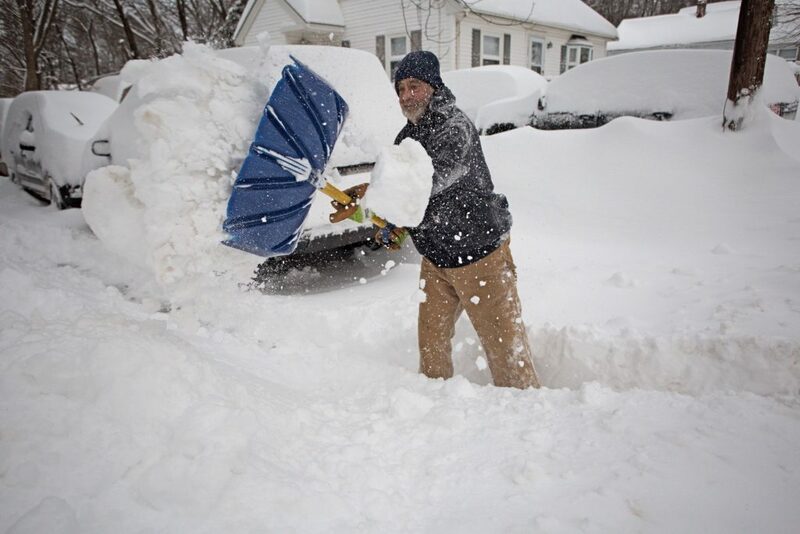 Bob Marine, a meteorologist with the weather service office in Gray, said some parts of the state, especially areas east of Brunswick, will likely experience blizzard conditions during the early morning hours Monday. That means three consecutive hours of visibility of a quarter-mile or less and sustained winds of 35 mph or more for the same time period. 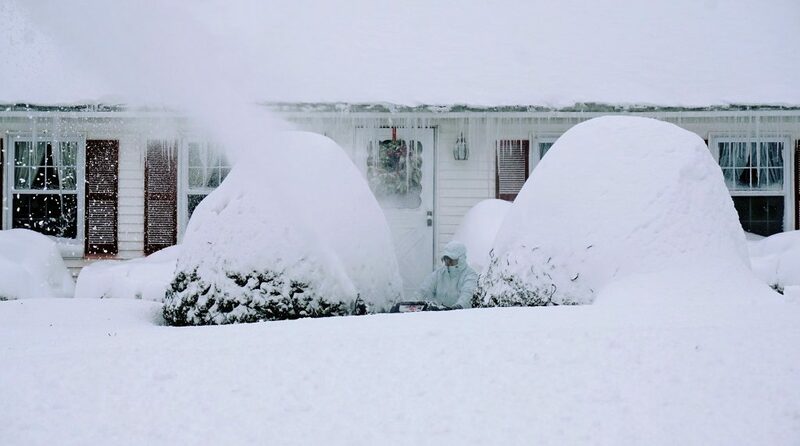 Washington County in Down East Maine was expected to get about 2 feet of snow by the time the storm moves out of Maine, with 14 inches of accumulation farther north in the Houlton area. 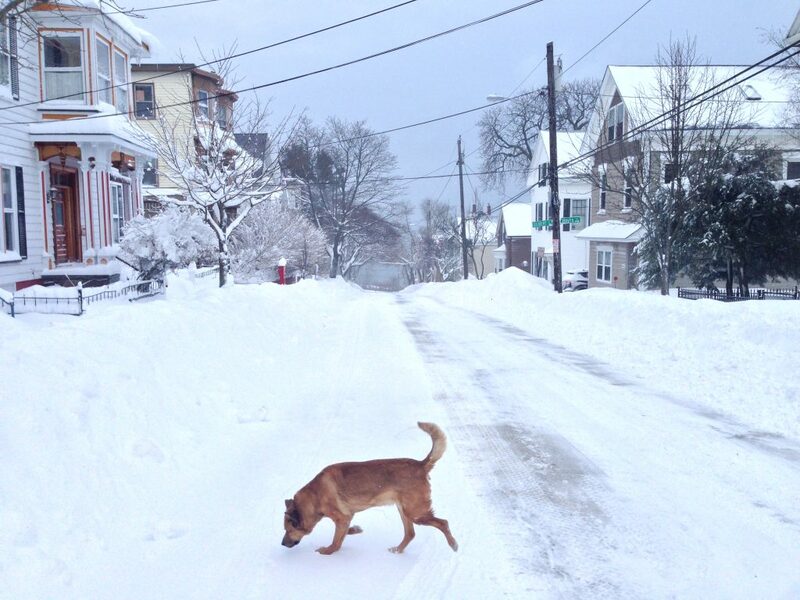 The weather service said the storm will start to taper off by late morning Monday in Greater Portland. By Monday afternoon, there should be no accumulating snow in the southern part of the state. 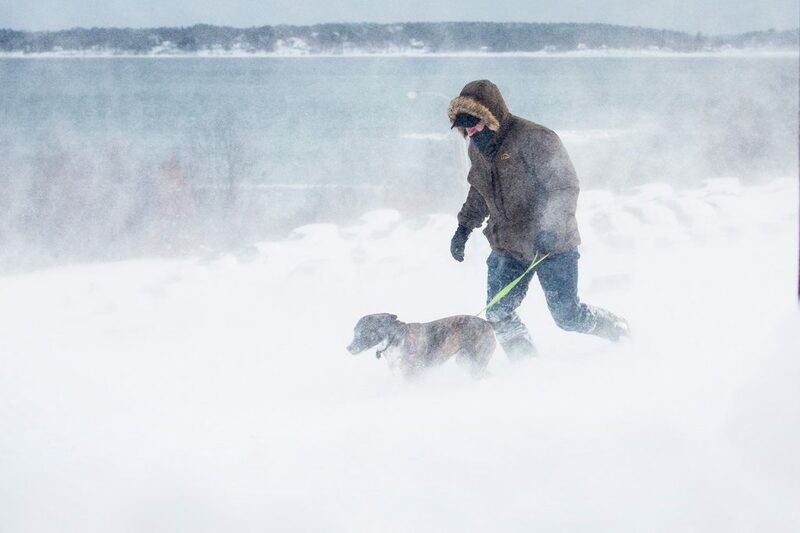 “We won’t have seen anything like this” so far this season, Andy Pohl, a meteorologist at the weather service office in Gray, said Sunday as the storm moved into Maine. 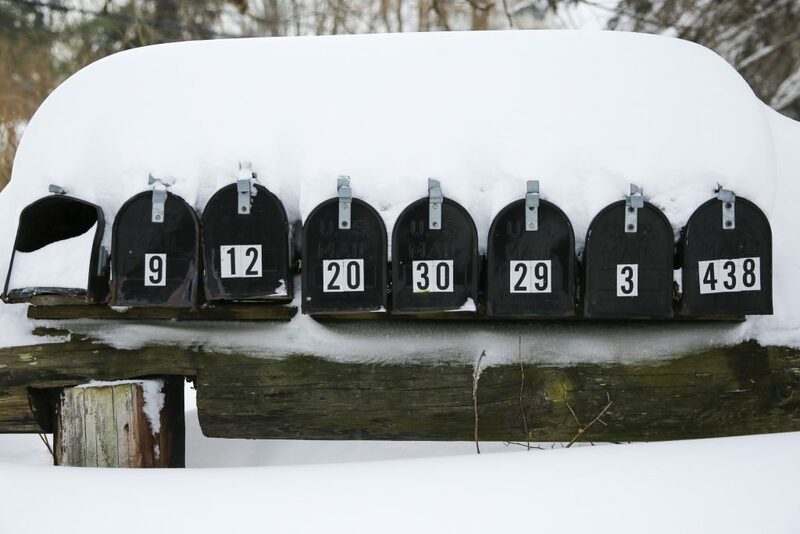 The storm triggered school cancellations in Portland and surrounding communities and the suspension of the Metro bus service on Monday, along with parking bans in several communities. The Portland International Jetport took the uncommon step of announcing that all commercial flights would be suspended for 24 hours beginning at 8 p.m. Sunday. Maine state legislative offices will be closed Monday as well. 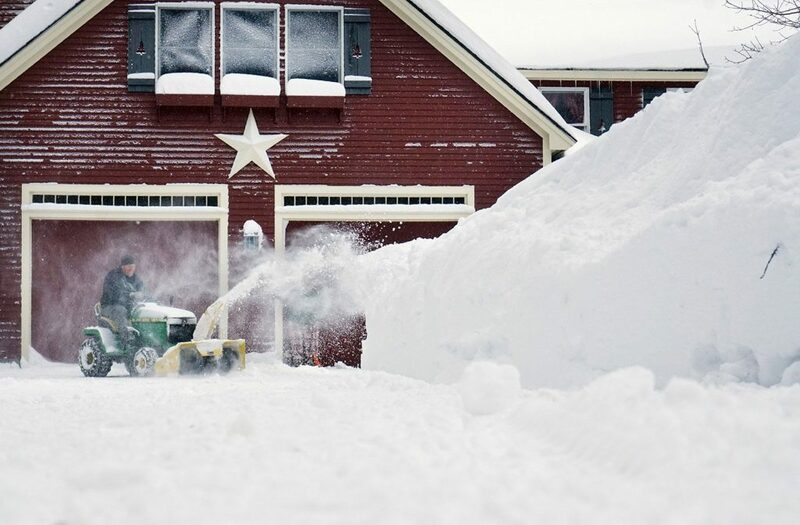 Bowdoin College in Brunswick declared a weather emergency Sunday and said only essential personnel should report to work. Classes have been canceled for Monday, according to a message posted on the college’s website. Colby College in Waterville and Bates College in Lewiston also canceled Monday classes and all nonessential operations. Pohl said the nor’easter is part of a persistent pattern of storms that have been hitting Maine for the past week. Another storm could blow in Wednesday night. 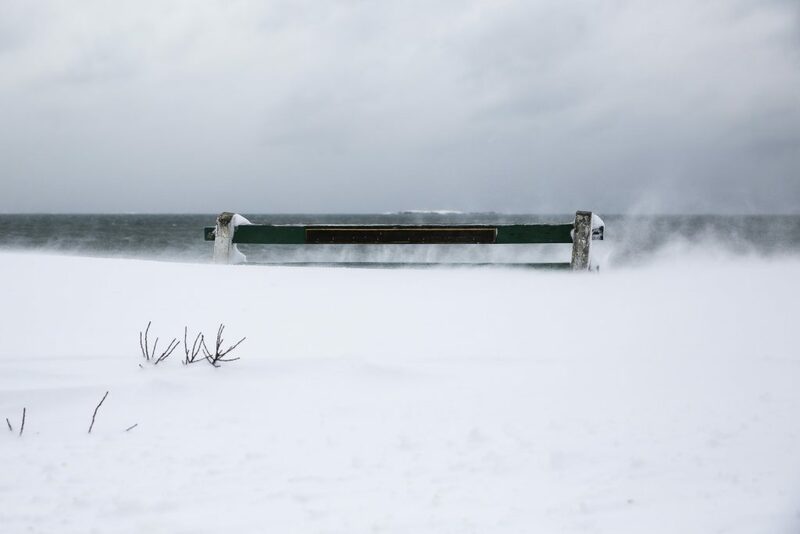 “We are definitely in a pattern with coastal storms every 36 hours,” he said. The Maine Emergency Management Agency held a teleconference Sunday morning with several other state and local agencies. 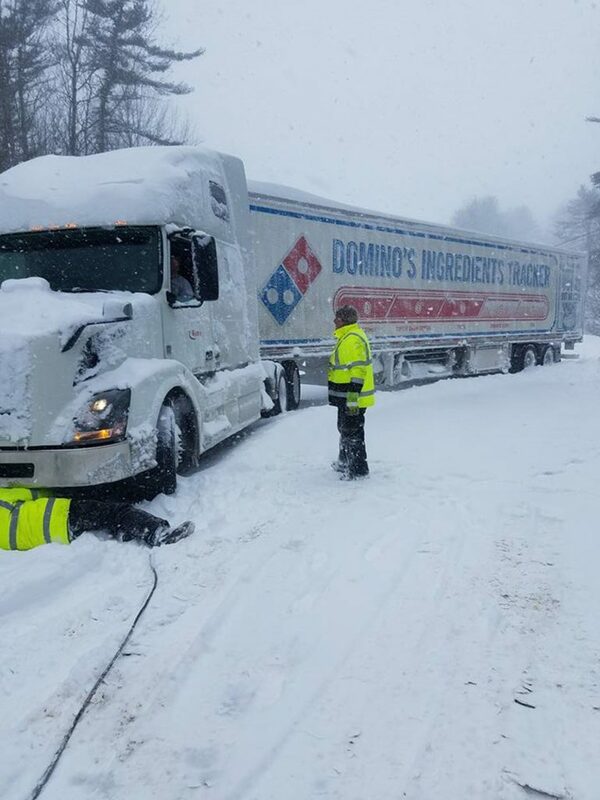 “This is a serious storm and we urge all Mainers to prepare and stay off roads so the Department of Transportation crews can safely clear the snow,” MEMA Director Bruce Fitzgerald said in a written statement after the meeting. Ted Talbot, spokesman for the Maine Department of Transportation, reiterated that message. 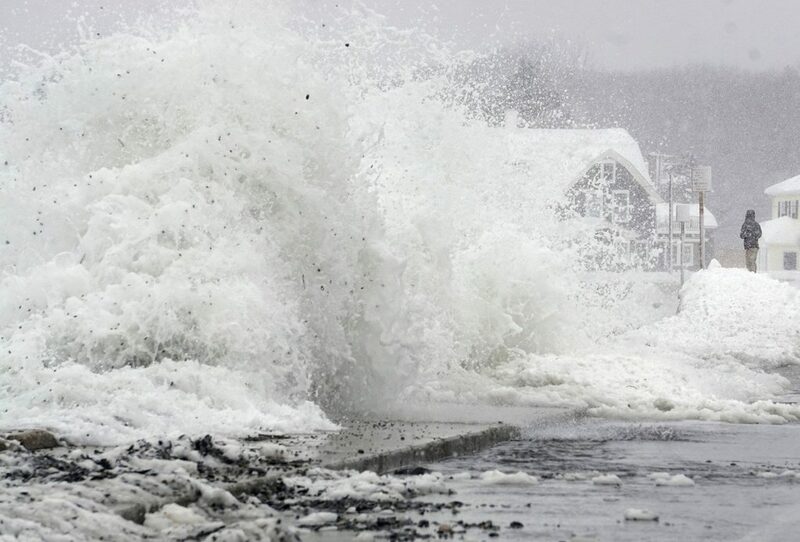 The storm that barreled into Maine on Sunday afternoon was accompanied by high winds. Gusts of up to 50 mph are expected along the coast, which could trigger minor flooding and beach erosion. 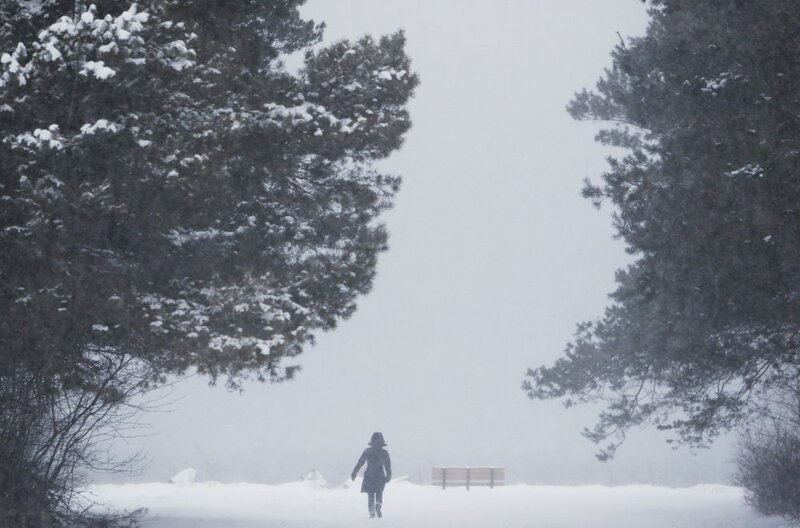 Temperatures were expected to dip into the teens Sunday night before rising into the 20s on Monday. Pohl said Maine could be hit harder than the rest of the Northeast. 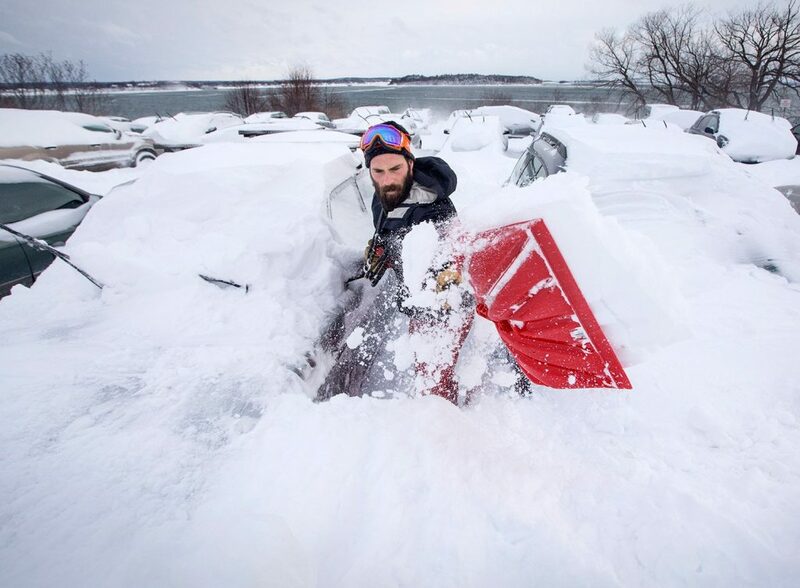 “Low pressure is going to stall over the Gulf of Maine and we’ll be in the sweet spot for snow for an extended period of time,” he said. Grocery stores saw an onslaught of business Saturday from customers stocking up their pantries in preparation for the storm, and shoppers were still out before the snow hit Sunday. Other businesses were scrambling to come up with a storm plan. With just 48 hours until Valentine’s Day, florists were trying to push their Monday deliveries back to Sunday . “There is always a fair amount of business the day prior,” said Mike Skillin of Skillins Greenhouses in Falmouth. He and his staff were trying to contact customers willing to take early deliveries and come up with a backup plan should their own wholesale deliveries get delayed. “The script might be a little different than what we expected, but that doesn’t mean it still won’t be a great day,” said Skillin, referring to Valentine’s Day on Tuesday. 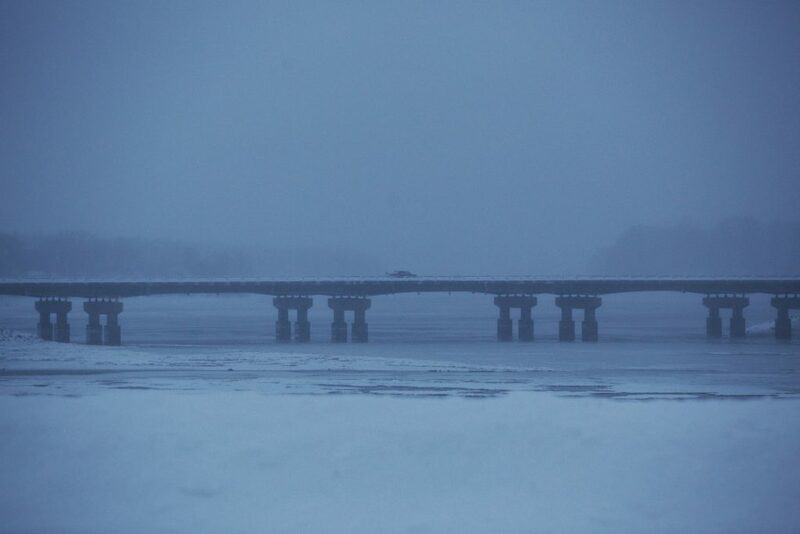 Speeds along the entire length of the Maine Turnpike – from Kittery to Augusta – were reduced to 45 mph at 2:45 p.m.
Maine Turnpike spokeswoman Erin Courtney said the speed reduction will remain in effect throughout the course of the storm. “It would be helpful if people could stay off the roads on Monday in order to let the plow crews do their job,” she said. Courtney said driver visibility during the height of the storm was expected to be no more than a quarter-mile. 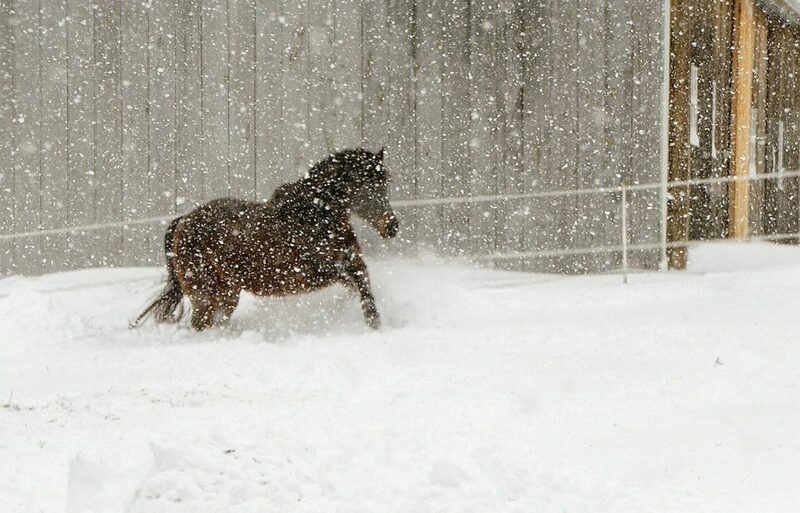 “Snow will be falling at the rate of 2 to 4 inches an hour during the height of the storm. 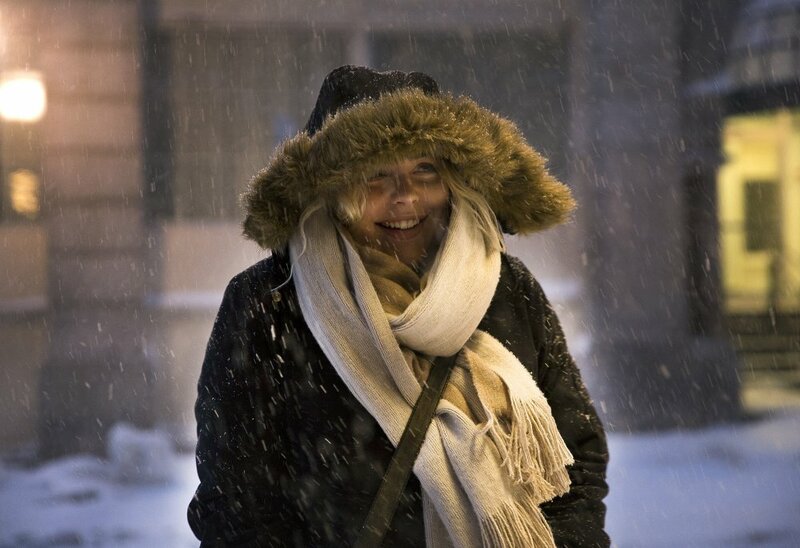 Those are blizzard conditions,” Courtney said. At the Portland jetport, spokesman Zach Sundquist said all flights had been canceled as of 8 p.m. Sunday. He said commercial flights would not resume until 8 p.m. Monday. Sundquist said shutting down the airport to commercial flights is uncommon and has not occurred in recent years. “We just want to get the message out that people should not be coming to the jetport during the storm,” Sundquist said. 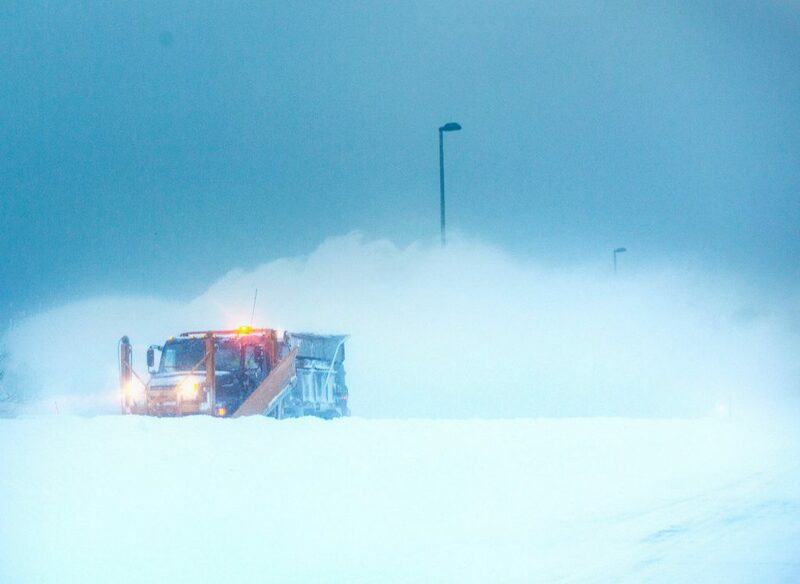 Despite the flight cancellations, Sundquist said airport snow removal crews are on site and will work through the storm to keep runways clear. Passengers should not come to the jetport to rebook their flights, but should contact their airline for assistance. The Amtrak Downeaster train to Boston, which was operating on a normal schedule on Sunday, canceled all but four trains for Monday. The only trains that will operate are the 682, 683, 684 and 685. Amtrak is expected to resume normal service Tuesday, as is the Metro bus service. 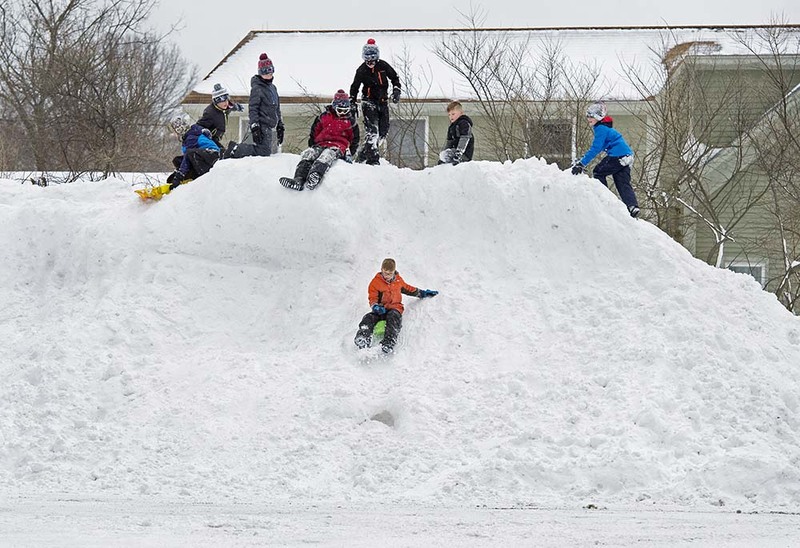 Most school departments in southern Maine on Sunday had already canceled classes for Monday. Among those were school departments in Biddeford, Brunswick, Falmouth, Gorham, Portland, South Portland, Cape Elizabeth and Scarborough. 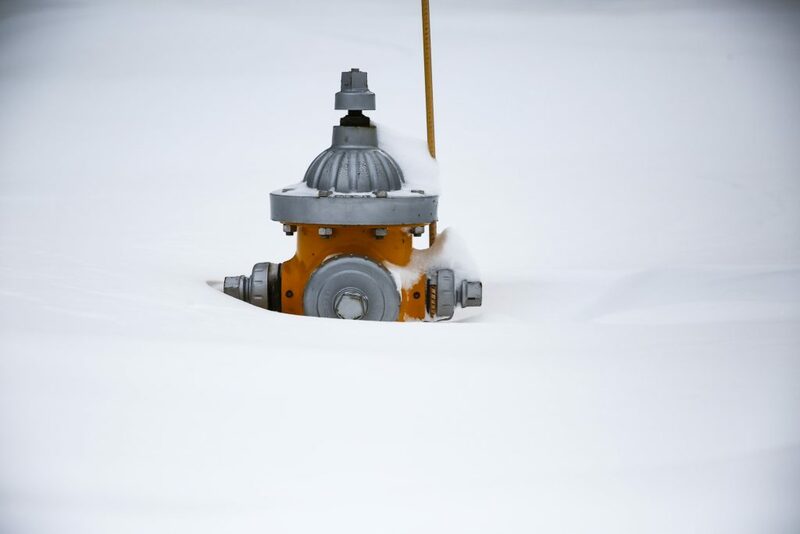 Some communities have imposed extended parking bans and canceled garbage services and municipal office hours for Monday. The town of Scarborough’s Police Department posted a message on its Facebook page urging residents to leave their outside house lights on as an aid to plow truck drivers. “Visibility will be limited and the lights help them keep their bearings,” the department said. Falmouth police encouraged people not to travel. 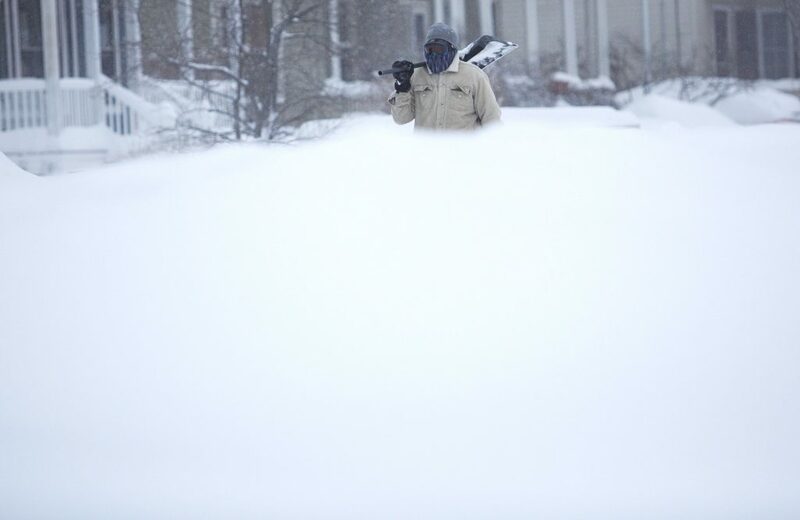 “We are encouraging everyone to cuddle up at home as much as possible,” the department said on Facebook. In Portland, officials announced that a citywide parking ban would be in effect from 10 p.m. Sunday through 6 a.m. Monday and again from 10 p.m. Monday to 6 a.m. Tuesday. Jessica Grondin, spokeswoman for the city, issued a statement Sunday informing residents that they will not need to move their cars from designated snow ban parking lots on Monday. 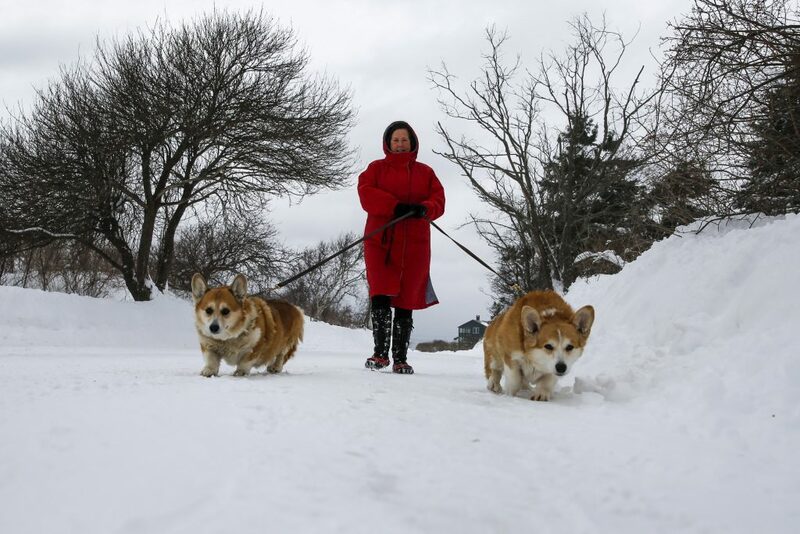 But they will be required to move their cars from snow ban lots Tuesday morning, once the snow ban ends at 6 a.m., she said. 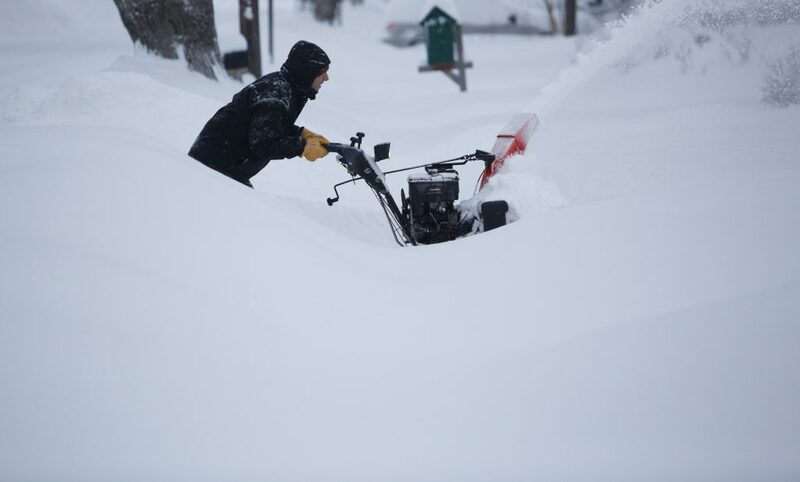 Grondin said that due to the volume of snow that is expected, plow truck drivers will have to push snow farther onto sidewalks, meaning it will take crews longer to clear sidewalks after the storm. 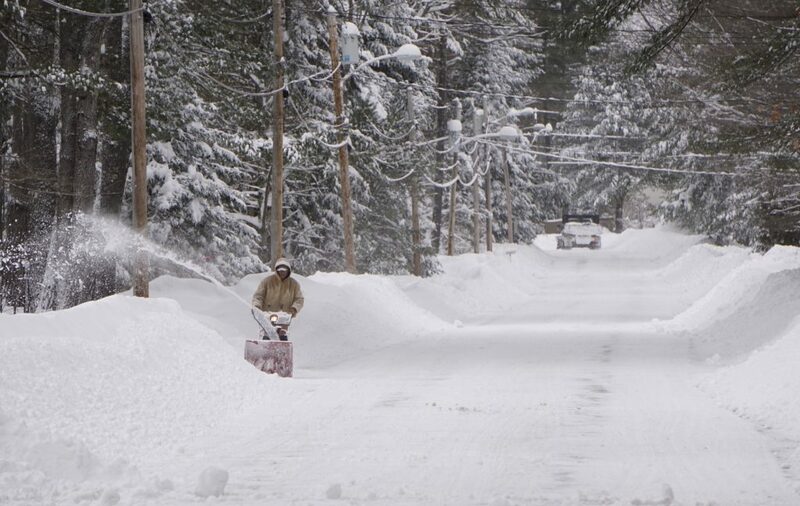 “We are asking that people have patience as we work around the clock to remove snow,” Grondin said. 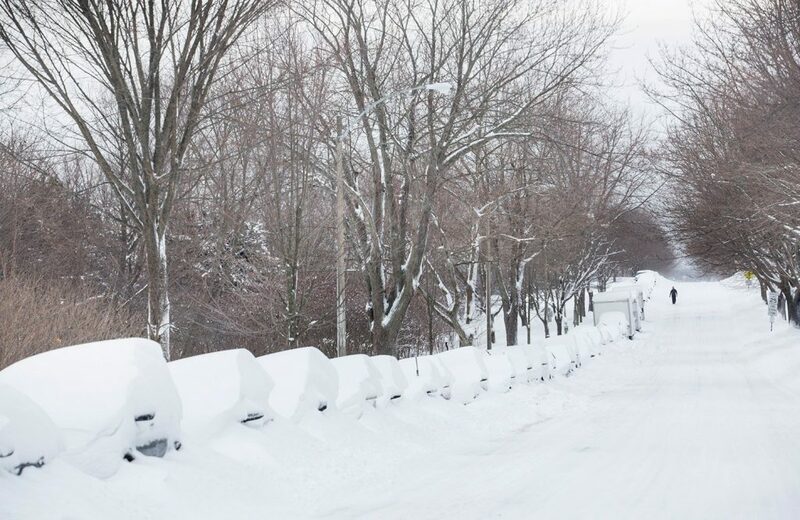 Among the communities declaring parking bans were Auburn, from 6 p.m. Sunday to 7 a.m. Tuesday; Biddeford, from 4 p.m. Sunday and through 7 a.m. Tuesday; Brunswick, from 7 p.m. Sunday through 7 a.m. Tuesday; Gorham, from 6 p.m. Sunday until 6 a.m. Tuesday; and Westbrook, from 8 p.m. Sunday through 6 a.m. Tuesday. 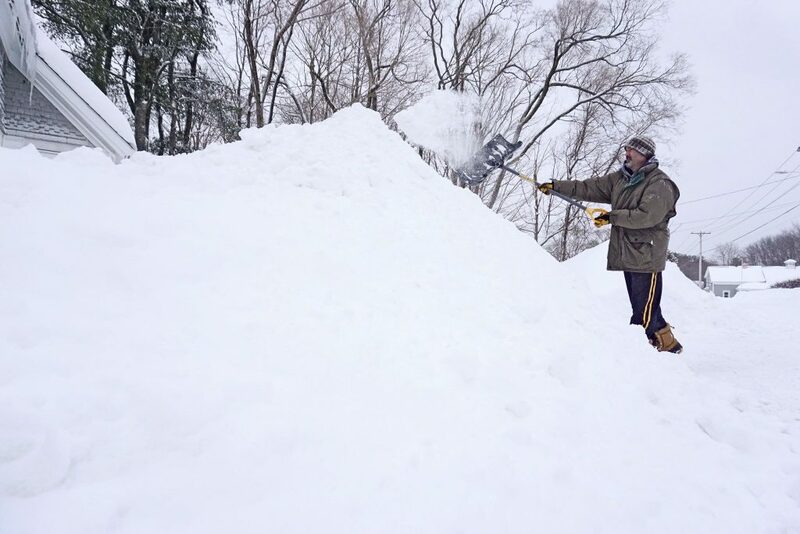 Marine, the weather service meteorologist in Gray, said Sunday night that the texture of the snow, at least in Greater Portland, should be on the light, fluffy side, as opposed to wet and heavy. 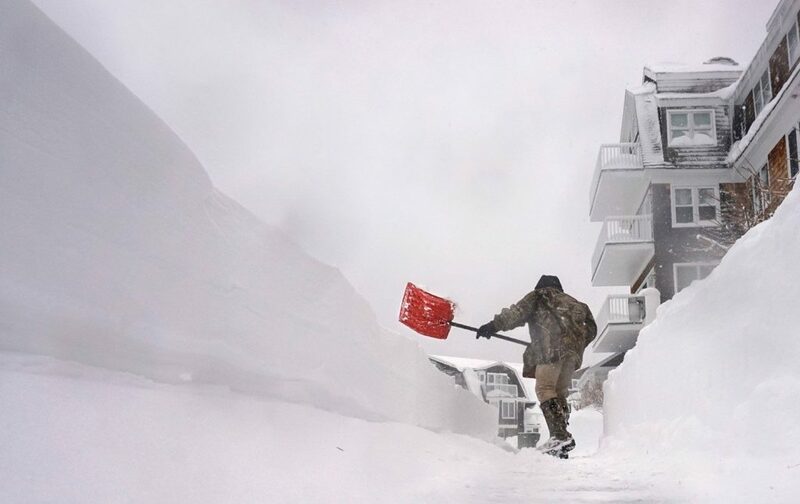 Though some television meteorologists were forecasting another major snowstorm for late Wednesday into Thursday, Marine said the weather service was taking a more conservative approach about the storm’s magnitude.